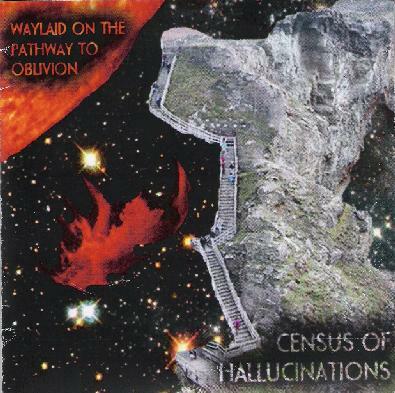 Census of Hallucinations - "Waylaid On The Pathway To Oblivion"
The latest from Census of Hallucinations (CoH) is a 2-CD, 25 song collection of previously unreleased tracks, including a handful of CoH favorites recorded live at a party on a boombox. Most regular Aural Innovations readers will be familiar with these folks. But in case you aren't, CoH is headed up by Tim Jones and Terri~B, who have also released albums with The Rabbit's Hat and Body Full of Stars. They also ran the Stone Premonitions label for many years, an entity that has only recently been reborn, after having been sidelined for a few years. The 25 songs on this collection do an excellent job of covering the gamut of what CoH are all about. Tim & Terri's music is truly unique and they have created what I consider to be their very own brand of psychedelia, which incorporates a variety of space rock, progressive rock, and even some experimental influences. As songwriters and singers they stand alone. Just the two of them and an acoustic guitar and you've got simply wonderful songs. And there is some of that to be found here. But most CoH songs are elevated, morphed and transformed into something more. Like the well crafted effects and killer guitar work on the spacey grooving "Don't Do It". And the cosmically enhanced acoustic song, "Chariots of the Gods (Break Out of the Trance)". "Painted Stone" starts off similarly acoustic, but about halfway through busts loose and launches into a trip rocking guitar jam. We've got the lysergic poetic theater of "The Dolphin Lady / Sgt Salts Shrike Food". And the high energy impassioned space rocking "My Room / Make Your Choice". Outstanding, tightly played rock music…. but freaky too!! And there are plenty of just really well done songs. For more information you can visit Census of Hallucination at the Stone Premonitions web site at: http://aural-innovations.com/stonepremonitions. Visit the Dynamite Vision web site at: http://www.dynamitevision.com.